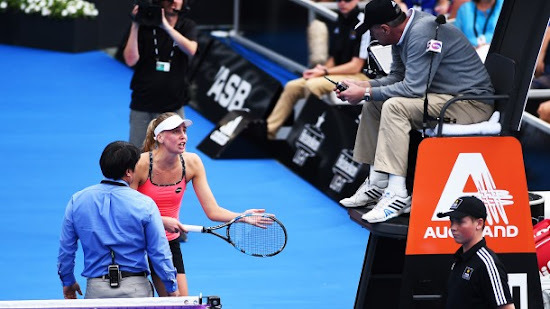 A tennis match at the ASB Classic turned into a heated spat between two players on Wednesday after Naomi Broady accused Jelena Ostapenko of deliberately throwing her racket and hitting a ball boy. 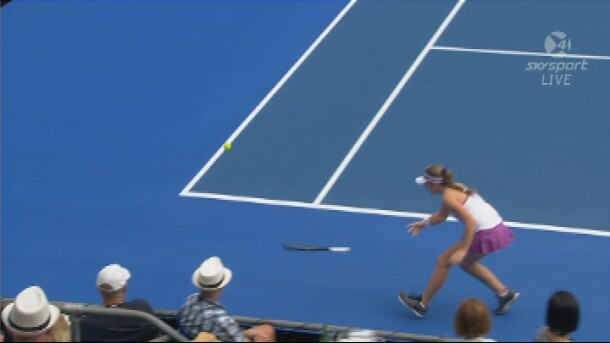 Ostapenko was running for a shot during the second-set tiebreak when her racket flew out of her hand, hit the back wall and then hit a ball boy on the shoulder. Broady immediately protested to chair umpire Blaze Trifunobski that Ostapenko should be disqualified. The ball boy was summoned and questioned by the umpire as the British player protested to Trifunobski, then to tour supervisor Tony Cho. Ostapenko said the racket had slipped from her hand and had hit the ball boy accidentally. The Latvian avoided disqualification but was issued with a code violation. Broady, who had beaten Ana Ivanovic in the first round, went on to win 4-6, 7-6 (4), 7-5 to reach the semifinals. The players shook hands at the end of the match, but then renewed their verbal dispute and had to be separated by the umpire before leaving the court. "It was quite clear that she threw her racket and it hit a ball kid, which should be disqualification," Broady said. "Jelena said to (the umpire) it slipped from her hand so it was just a code violation or something. On the replay it is quite clear, but that's tennis and I managed to keep myself together quite well."